Whenever I visit my friends in Oregon, I return home with new ideas for my pollinator garden. Of course, Naomi and Larry Price live on the high desert and I live on the edge of a rain forest, so our climates are like night and day. Still, they water their gardens and I tuck some of my plants under the eaves, so we have many crossover species. Many of the mints are pollinator wonders, yet they are very tolerant of the subtle distinctions between deserts and rain forests. I love them. This year I saw motherwort for the first time, and I enjoyed seeing all the pollinators head-butting each other off the small, hairy flowers. Motherwort is a mint family plant called Leonurus cardiaca. Oddly enough, just before my visit I had been asking around about worts. What makes a wort a wort? Apparently, the word just means “plant” and the name was applied widely by herbalists. A plant might be named because of its attributes, the way it was used, or the body part it resembles. Apparently figwort plants were used to treat hemorrhoids and hemorrhoids resemble figs. That’s weird, right? Honeywort produces scads of nectar, so that makes more sense to me. Then there’s bladderwort and bruisewort which are self-explanatory. Burstwort was used for treating ruptures. Anyway, you get the idea. Wikipedia has a list of wort plants that is fun to scroll through. I don’t know how many are listed, but there’s a bunch. At any rate, motherwort is an introduced plant that has spread over most of the US. It can be a weed or a planting, depending on your mindset. It likes pastures, open fields, roadsides, and disturbed areas. Like many mints, it’s at home nearly anywhere. The plants are drought tolerant but can grow to six feet tall if they have plenty of water. Flowers begin appearing in May and, depending on the climate, can continue blooming until November. The flowers are very hairy, and they can range from white to pink to purple. Bees seem to love the plant and it can produce a good crop of honey, especially in areas with a long growing season. In other words, not here. The honey produced is a light pale yellow with a mild flavor. Gardeners should be aware that, like most mints, motherwort can be invasive. So, depending on your area and your purpose, you may want to keep it in check. Still, if bee forage is what you’re after, it could be right for you. Still, I wonder what the purpose of motherwort was. How did you use it on mother? Or maybe it was to protect one from motherhood or to promote motherhood? Or cure one of motherhood. Who knows? Motherwort provides both nectar and pollen. Here a bumble bee forages on a tall plant. © Rusty Burlew. Motherwort has the typical square stem of a mint-family plant and the characteristic mint-shaped flowers. © Rusty Burlew. But just a few weeks ago, I had an urgent work project, from dawn to dawn, I was stressed and I needed something to calm me and perhaps also strenghten my heart: mother wort is named „heart plant“ in my language. I was surprised when I learned that a tea had properties similar to valeriana. Could it be that these calming properties gave it its English name? For two weeks, I keep drinking it almost daily – the plant is non toxic, just like mint and I am mixing it with mint: one leaf of motherwort, one branch of mint and an approximately equal amount of sea buckthorn leaves, and a liter of boiling water… it tastes really good. I have plain old mint in my garden and I was surprised that it was covered in bumble bees at all times – the flowers are so tiny. Later in the season I did see a few honeybees on them but nothing like the bumbles. Some plant names are just too strange – like mugwort and wormwood. They don’t sound enticing or interesting. I prefer to call them by their genus “Artemesia” – it sounds so much nicer. Despite the name, I will be adding Motherwort to the garden next year. Thanks for the tip! Motherwort relieves tension in the womb (formerly called ‘the mother’). It’s a nice remedy for PMS and menopausal transition where the flow is scant and there are cramps. The Latin name, Leonurus cardiaca, or “lion heart” refers to its ability to relax the heart as well (they’re both muscles, after all). This makes it doubly useful for menopausal women who have heart palpitations. Don’t. Motherwort is extremely invasive and extremely unpleasant to deal with, prickly and tough. Years ago my ex said we should encourage the single plant in our fields and now I have thousands of the damned things and more with each succeeding year. It is surely something to remember her for, if you know what I mean. As for the bees, I have never seen them on motherwort. One of our bee yards is surrounded by mugwort and I have yet to be mugged there. The honey bees were not really interested in it this year, must be something more tantalizing was available when mugwort was blooming. My bride grows motherwort in her herb garden. It is a bit plain in its beauty but the plant is favored by “both bees and menopausal women” and so it stays in the general area where we planted it. When weeding the deliberate yet casual garden it inhabits, I do gripe about it some. That it seeds itself a bit freely is not my lament — I can easily keep some and delete others based upon my whim, and it pulls out reasonably. 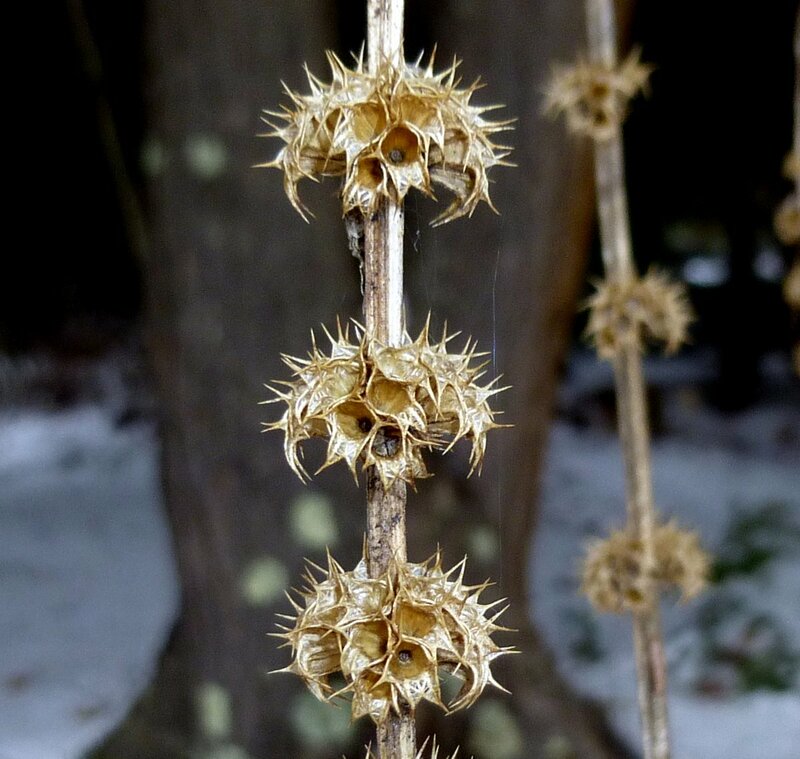 But alas, its many-pointed seed heads catch themselves on anything the least bit inviting, be they socks or fleece vest or my head of hair. The well-disciplined gardener is attentive enough to never lets the spent flowers stalks stick around longer than a few days. Alas, that rarely describes me, and so before entering inside I must sit in intent concentration on the porch, plucking and pinching and picking off whatever seeds I find, and hoping (in vain often) that my effort works, that this time we can safely navigate the house barefoot, free from motherwort’s pesky sharp bits. Ahh the sorry life of a gardener. I have been furiously pulling it out. Did not know the name and didn’t notice the honeybees particularly interested in it but the bumblebees like it. I live on the coast in a wet area. It does spread readily.